Control, manage and enhance IT assets of your company. Landpark helps you achieve optimal management of your resources by providing state-of-the-art ITSM software solutions. Thousands of companies have benefited from our ITAM expertise. IT managers have been able to exert full control over their IT resources. 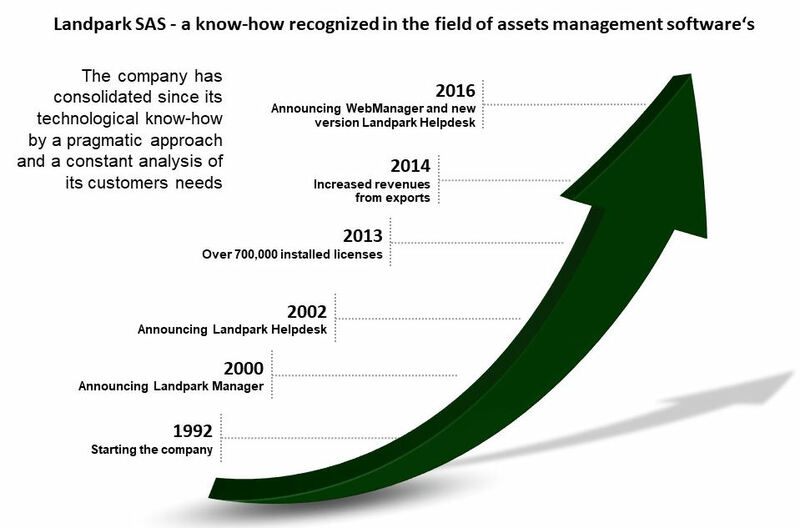 Founded in 1992, Landpark SAS has acquired a recognized know-how in the field of IT assets management software's. The company has consolidated since its technological know-how by a pragmatic approach and a constant analysis of its customer's needs. Since 1998, the company - strongly present in the asset management software's marketplace was implied to many projects with industrial or services companies, large accounts and administrations. Landpark SAS has a true technical know-how as regards as new software's and always knew how to make convenient choices on its strategies and developments. 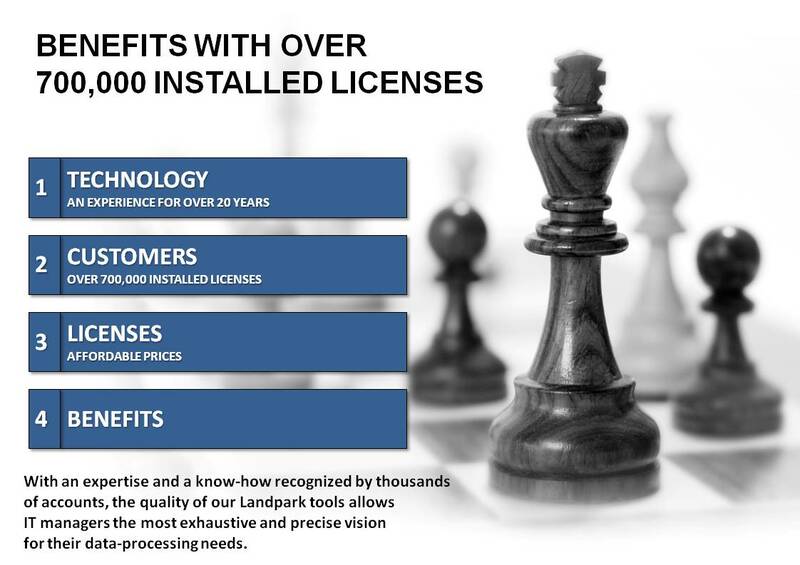 Several thousands of customers already bought Landpark software's. Landpark allows an increase of our activities thanks to our technological know-how on which the company capitalizes. While bringing today our competences - expertise and developments - Landpark SAS becomes today a major editor with significant number of solutions. Landpark SAS invests a significant part of its annual sales turnover total in R & D. Capitalizing on the experiment of its customers; its software engineer's teams are permanently trained with new technologies. We are very pleased to announce that 2017 showed a significant rise in terms of new customers and a significant increase in terms of installed licenses. The complimentarity of our teams and our products strategy allows us to offer our customers a wider range of solutions based on expertise and methodology. Landpark has established a good reputation into the IT assets management market, an image that is a direct result of the quality of our products. Parameters that we have today allow us to consider that 2018 will be another year of strong growth. Ongoing dialogue with our customers, along with the skill of our teams bring you the best partner for your project, an asset for your success. Landpark software’s are ready to use, require no expensive developments, no special maintenance. Software generally available on the market are either software for large companies managing extremely large assets, a cost, a complex work and bringing intensive resources (studies during several months, important trainings due to the complexity of products) or minimalist products, giving limited access to your data and not allowing a continuous and rigorous monitoring of your IT assets. Our experience on a very large number of projects indicates that the most successful companies consider assets management as a full strategy to reduce overall total cost inherent in the operation of their IT assets. As part of this strategy, the success of your project depends largely on the implementation of quality tools, allowing you a rapid return on investment and improved productivity gain. Knowledge and detailed follow-up of the data-processing infrastructure. Control of a complete management system implies a perfect control of the inventory, management and helpdesk. The installation of a helpdesk solution to users, in order to assist them effectively by knowing their technical environment. Founded in 1992, our company has acquired recognized expertise in PC software. The company has since consolidated its technological proficiency with a practical approach by constantly analyzing the actual needs of its clients. We operate in the field of management software IT assets, with over 20 years experience in over 20 countries. We work with each client to meet their needs and establish a lasting relationship with him. We are sensitive to the needs of our customers with a trade policy based on transparency and mutual collaboration. We offer the best quality and functionality at the best price. We develop our products to meet the customer's real needs and that our products make a difference. Our wide range of software and services gives our customers the advantages to our competitors. We have a technical support that will bring incremental benefits. Our Approach to asset management and help desk technology has proven reliable and sustainable over the years. Thanks to the added value of our approach, we are able to assist you in your ITAM project. Protection of Intellectual Property. To this end, our source code is audited by Logitas in order to establish Landpark ownership. Protection for End Users with respect to software maintenance. In the event of termination of maintenance on behalf of Landpark without activity picked by a buyer within 1 year period, we authorized End User to access source code with Logitas. The use of the source code will be limited to maintenance requirements and for the exclusive benefit the End User. Landpark source code as well as the components needed to make the version available. The description of the development environment, as well as the associated supply data. The file outlining manufacturing instructions on how to manufacture the deliverable version since the installation of the development environment, restoration of source to the production of distribution of the software. The materials design such as the functional and technical specifications, the rules of development patterns in the database, test plans, etc.